Privatize our boat for an unforgettable day! Denebola is a spacious and comfortable sailboat, it is the guarantee of a convivial day to live in private! Your captain is at your disposal to concoct a customized program tailored to your desires. Robert’s Bay has magnificent landscapes with 10 protected islets and exceptional white backgrounds. You prefer to relax in the warm waters of the white sands (fonds blanc), drinking your Planteur punch while lobsters cook on the barbecue.Or choose a pause at noon at the islet Madame.We decide the afternoon programme together, deciding what islets you would like to visit. Navigation under sail is for short periods and we stay in sheltered zones within the Bay of Robert. 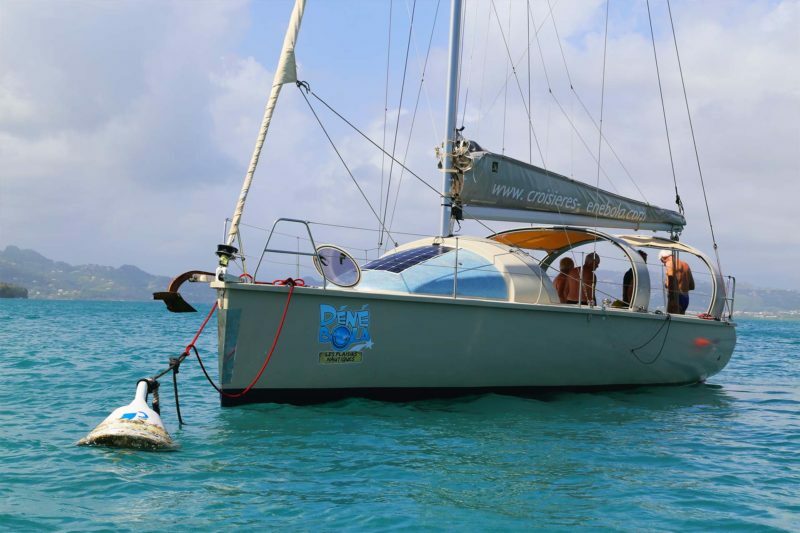 You are sheltered from the open sea waves and sailing is calmer, allowing anchoring in more out-of-the-way places like Bay of Saint Pée, islet Petite Martinique and other islets. Consult your crew to choose the best programme. How pleasant it is to sail in silence, pushed only by the wind, comfortably seated in the spacious cockpit of Dénébola! The boat is ideal for sailing in complete safety. You are at the helm, watched by your skipper. Ready about! The boat lists slightly which is normal for a single hull. The Bay, although windy is protected from the swell, and we tack to go to isletMadame. If you don’t bring your own picnic, Dénébola offers a 100% local menu, vegetarian accras and crudities. Hot main course gratin de légumes (local vegetables cooked with bread crumbs and grated cheese), rice, browned chicken marinated in old rum. Drinks: Home-made Planteur punch, ti-punch, coco punch fruit juice, coffee, beer, flat and sparkling water. Snack: vanilla or cinnamon flavored biscuits. The Bay of Robert has numerous coral reefs which can be visited with fins. You can choose where to anchor (your skipper will advise you). You can come with your own kit or rent the exploration kit. CLEMENT white rum and old rum available on the yacht.